On Yahoo! Answers, the questioner is expected to select a Best Answer- the answerer gets 10 extra points and supposedly this indicates a specific answer was the best match to the question asked. For obvious reasons, one of the rules on Yahoo! Answers is that you are not allowed to use multiple accounts to ask, and answer, your own question. Aside from the dishonesty involved, it is seen as “points gaming”- falsely collecting points to boost the level of your account on Yahoo! Answers. Normally this is difficult to detect- but what people sometimes forget, is that if you alter your profile it is retroactive and changes all previous questions and answers that your profile appears in! I’ve posted about this effect before where James/Ya’akov changed from a 70 year old mother worried about her daughter into a far younger man- but here we will see something else- how a poster utilising multiple accounts for dishonesty and points gaming, changes their details and ends up answering themselves since both accounts are now identical. Lest you think the above two are her only accounts we have another (screenshots for all three below). edit: Adelphi and her “messianic jewish” friends are trying to claim that because it has a Yahoo! Canada header and adelphi claims to be in the USA, it cannot be from here. They edidently think everyone is an idiot. Here I am sending email from Canada, Australia, Brazil and France, visiting all these countries in a mere 8 MINUTES! LOL Don’t forget0 in that time I was also in each country long enough to log into Yahoo! and send an email before moving onto the next country! Hmm, I should patent my transport sytem it is definitely far more efficient than anything else on the market! Better teleport to France otherwise its going to take more than a few minutes to get there from Brazil! Hey, you know its a much nicer summers day here in Paris than in cold Jo’burg- anyone know of any Kosher places along the Champs Elysee? I need to relax after all that hectic travelling! Of course the reality is that it was all done from Johannesburg and one can appear to be any where in the world. It is laughable that after being so thoroughly caught out, Adelphi is using such a pathetic excuse. evidently she thinks everyone is an idiot! shame, evidently getting caught out is a real shock to their system which they cannot handle! I’ve always said I had more than one Adelphi account for commenting on Comment sections. I wouldn’t trust you or your allegations under any circumstances. Also, if you’re banned my Adelphi Account, how could you possibly have gotten pictures of my Profile Page? On three? Not just one? You’re banned on all of them numb-skull. And Adelphi, to get pics all you have to do is logout and go to the link while logged out. What, you think the system can pick you up when you aren’t logged in? Actually, it is only the users Questions you cannot see. You can still see the profiles of the people that have blocked you. Shame, you so desperate to try and undo the damage you have done to yourself? And even here, when you are caught out, you try to lie! You don’t just use your accounts for commenting- one of those pictures is of you, answering yourself and awarding yourself best answer! Shame, you so desperate for recognition you thank yourself for picking yourself? Of course, one has to thank you for finally showing your identity “Hebe”/”Regina Epstein” LOL What, you forget that unlike on yahoo! Answers, over here I can see your IP and pick up your multiple account abuse immediately? Unless you can find some comment I answered on a question addressing you, I consider that 89 point Adelphi a contrived, bogus set up ment to trap me. The answer was mine, but the question wasn’t. Just like I saw your name/picture duplicated a few days ago, I’m chalking it all up to that. I even researched the “quote” referred to and nothing is on Yahoo Answers that remotely resembles it. Allonyoav, I’ve reported this to Yahoo Security, as I should do. You thrive on this type of stuff, don’t you. What is the next put-up you’ll post here since you have nothing real to show? Of course you pick and choose what will appear on your questions and answers, so I have no doubt being ‘fair’ would interest you now. Talk about lies, deceipt and misrepresentations of Messianics? You could have that applied to you any day of the week. And you gotta love the threat to report me to Yahoo! security. Heh, lets see- I’ve been sent fake legal threats supposedly from Yahoo! legal, given fake legal advice and been told that I have been reported to the FBI. Heh, and they still don’t get it that I don’t get intimidated by silly threats! Busterbuddhabelly? Come on now. I’m going to refer to that as me? Another insult you clown. Why does Adelphi/Yeshua’s email have a YAHOO CANADA heading if they don’t live there? Simple question. Doesn’t work for me even if I email through YAHOO CANADA and live in Arkansas. You don’t think that is strange? Do you live in Canada? Trying to figure this mystery out. Look at the supposed email I sent you. It has a Yahoo Answes CANADA header. That header doesn’t appear if you enter into any of the sites above. Are you deliberately trying not to admit that? Heh- Adelphi really is desperate to try and claim innocence despite all the evidence to the contrary. It really is a shame she doesn’t just have the basic honesty to admit to what she had done and apologise, but continues to try and obfuscate LOL shame, it must be horrible when you realise how badly you have messed up! Hey, adelphi, you like the edit showing my rapid world travelling skills? Adelphi, so now I know all the emails you sent me saying “sorry”, and “I’m not messianic”, “I’m trying to get rid of comments” is all a fake. 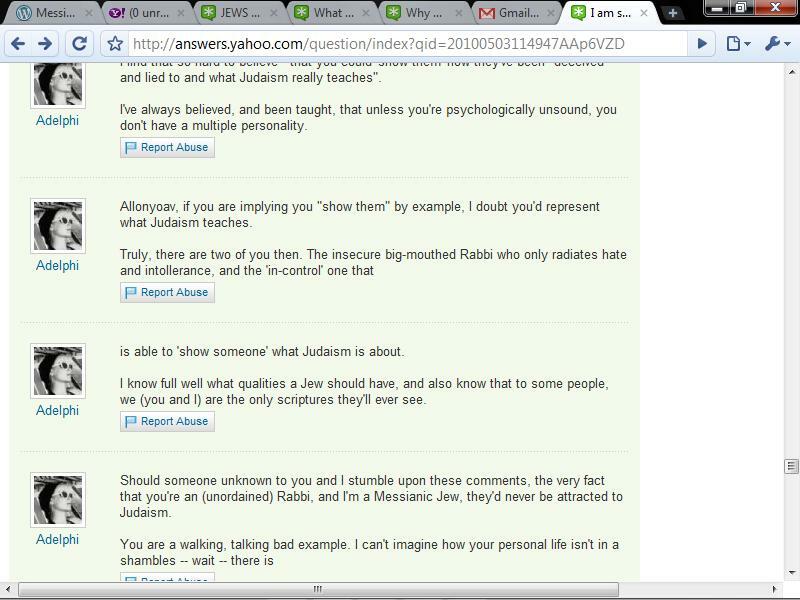 And BTW, you are the user Shay (aka Yeshua), and you might be James (aka Yaacov). Allonyoav, please if you have time, just tell me the chapter in Moreh Nevuchim that the answer’s in. Thank you. Australia, France and Brazil say nothing in the headers where they came from. All thy have is the native Portugese, French and Australia in English. Bad examples. So you were off to Australia, France and Brazil eh? Take it off, you look like a fool. Thank me for saving your dignity. PLUS, last I looked at that \”Adelphi\” accont it had both the email and IM open. Where\’d you get that screenshot from? Shame- Adelphi really is desperate to try and save face! LOL I guess she doesn’t realise that different Yahoo! Servers use different headers. Heh, anything to try and explain away her dishonesty- all the while failing to realise how much worse she makes herself look with her attempts to try and pretend she hasn’t been caught out using multiple accounts. It would be far better for her to just apologise and correct her behaviour; instead she just make smatters worse with her attempts to obfuscate the issues! Shock to my system I can not handle? Yehr, right. The earth moved under my feet. The more you post the more ridiculous you look. Get those anine emails you sent yourself, the headers DO NOT say BRAZIL, FRANCE and AUSTRALIA. You should be so lucky to get even a slight rise out of me. Hey, the FBI didn’t show up at my door, dumbell! Your reputation is growing all over the world. Maybe your mission in life was to make people laugh. But your deteriorating vocabulary and falling back into immaturity and baby speech shows how much you have been shaken! LOL and yep, my reputation is growing- but for the good! It must irk you to no end to know that as the site grows, my support from real Jews grows! Shame, your anti-Semitism just helps this site and gives me so much material to show about your cult! Quick comment: As you spend more and more time here, your Musings of an “Orthodox Jew” deteriorates. It had more pizazz before this fruitless endeavour started. The only one who answers your questions is Gabi, who I happen to admire by the way. I’m sure he’s your biggest fan here too. Let me guess? I took your advice and checked all four of your emails. Not one has YAHOO AUSTRALIA-YAHOO SPAIN etc. Oh, and “Christian”, you do realise that while yo can alter your IP- the email you enter is also visible to me? LOL so, which Id do you prefer? “Laurie”,”Christian” or “Geek” ROFLOL You guys really do insist on making your dishonesty blatant! LOL- R’ Marc so true! Strange, most of the content and exact sentences , sometimes entire paragraphs are identical to this posted by Shuckles Clown. Maybe Shuckles is Joshua or Adelphi, or they’re both entire someone else. The plot thickens. Don’t you realize most people don’t care? That this person is possibly behind many of the other accounts and uses multiple other IDs I have no doubt. Howver, until such time as I have the screenshots or other information to prove it I’ll abstain from making connections to other accounts. Others care and applaud this blog! Showing just how insulting and deceptive ‘messianics’ can be is an important task that ME has taken on. Jews are obligated to stand against such harmful tactics and blasphemous beliefs from entering real Judaism. We’ve already seen results from the blog by disappearing comments and even answers in R/S as ‘messianics’ quickly try to sanitize their past dishonorable behavior. Even people that don’t “like” this blog, *know* it is an effective and factual one. by the way, I installed a new firewall to be safe. I did knot no they were lurking covertly on the internet. Is my old Yahoo email address safe to use? I just swiched to Worldnet because of this–the further away from Yahoo the better with all this happening. What if James writes me who should I contact. I am a bit disturbed. WHAT DO I DO? WHO DO I CONTACT. DO YOU HAVE AN EMERGENCY HOT LINE? « Tactic: Using multiple accounts to tag team to attack others.